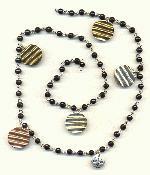 An important part of most jewelry designs are beaded chains. Shop our unique and vintage online collection of beaded chains. Our vintage beaded chain include round beaded chain, pear shaped beaded chain, pear cable chain and cats eye beaded chain.